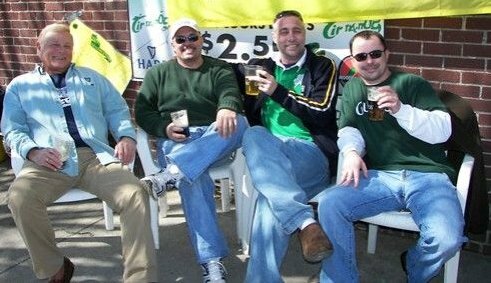 Most of my accounts tend to begin from some corner bar stool; but this particular narrative has its roots at a different corner several miles away from the warmth and conviviality of the Tir na nOg Pub in Trenton, NJ. In 1783 Elizabeth Martin transferred a small cottage and a few acres of land located in Bordentown, New Jersey to Thomas Paine. This piece of real estate may have had as much influence on the life of the late “Irish Billy” Briggs, as did any of the four public house properties that he owned during his own lifetime. Billy grew up in Bordentown, and during his adolescence he developed an acute interest in both American and Irish history. Thomas Paine was a personal hero, and I suspect Billy could easily draw parallels between the American cause during the Revolution and the Irish troubles with England. 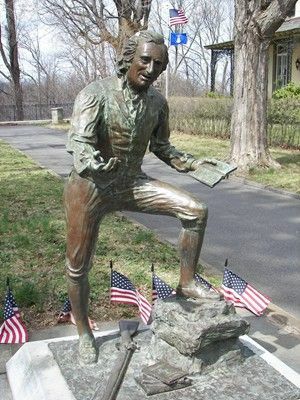 Recently Billy’s widow, Margaret O’Donnell-Briggs, told me that her husband would quite often begin the American tour for their quests from Ireland with a pilgrimage to Prince Street in Bordentown, in order to view the bronze statue of Paine. With his eloquence and pen, Thomas Paine ignited and sustained the struggle for freedom and justice in the American colonies. 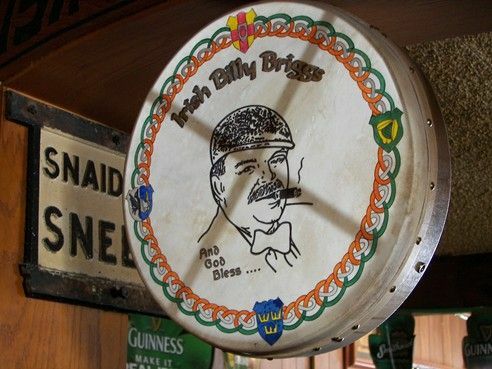 Armed with a banjo and a sharp wit, Billy Briggs would nurture and support a similar cause in the Irish community on both sides of the Atlantic. His unwavering dedication won him the praise and respect of those who were at the forefront of the conflict, and men like Sinn Fein President Gerry Adams and Senator George Mitchell called him friend. Regrettably, I never knew “Irish" Billy Briggs. 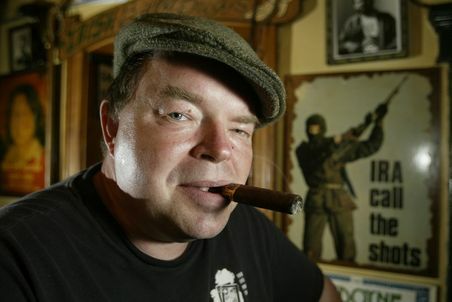 My knowledge of the man comes by way of the countless testimonials generously offered up by the loyal staff and patrons at the Tir na nOg, most of whom I met on this past St. Patrick’s Day. A last minute change in plans brought me to this truly remarkable tavern. 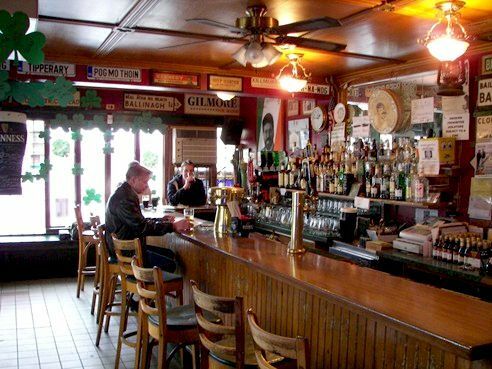 There are countless Irish looking pubs in this country; but there are only a handful that can be considered genuine and true to the Irish tradition of hospitality. Upon entering there was this immediate sense of welcome and acceptance. It brought back memories of my youthful wanderings, and those caring strangers along the way that would provide a good meal, a good drink and a good conversation. 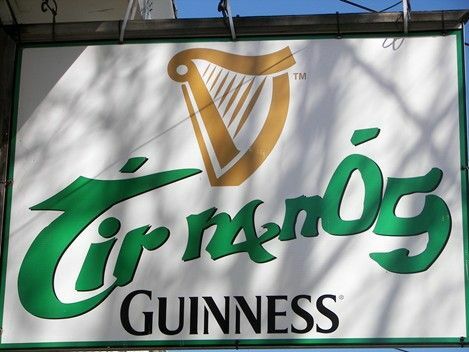 The Tir na nOg does not offer food; but not to worry, their hearty pints of Guinness provide amble sustenance for both the body and soul. The powers that be at the St. James’s Gate Brewery have recognized this and have bestowed their accolades upon the pub on more than one occasion. For those that insist on solid nourishment, a number of local eateries will deliver the appropriate repast right to your barstool. ACCOLADES FROM GUINNESS ADORN THE WALLS ALONG SIDE OF PHOTOGRAPHS, POSTERS, SIGNS, MEMORABILIA, CELEBRATIONS, PETITIONS, VINTAGE NEWS STORIES, AND CARTOONS ALL PERTAINING TO THE "TROUBLES" BETWEEN THE SUPPORTERS OF AN UNITED IRELAND AND LOYALISTS TO THE BRITISH CROWN. 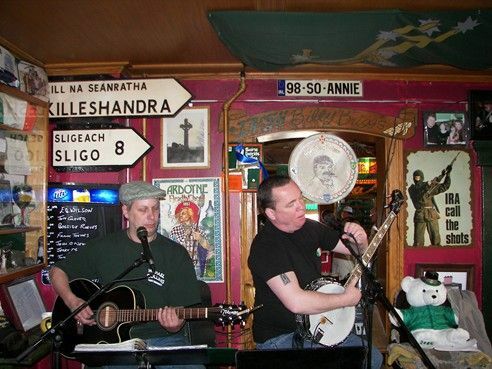 TOM GLOVER, BILLY BRIGGS' LAST MUSICAL PARTNER (LEFT) AND TOMMY McCLOSKEY PROVIDE SOME ROLLICKING IRISH TUNES FOR EARLY AFTERNOON CELEBRANTS ON THE HIGH HOLY DAY. 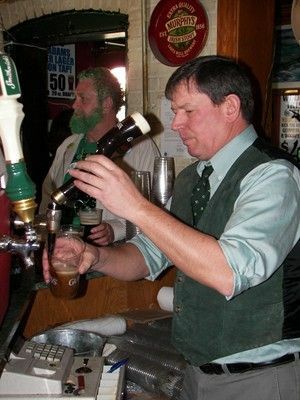 BARTENDER CHRIS WHALEN (FOREGROUND) AND BAR MANAGER FRANK CONNELL ARE BUSY TO SAY THE LEAST ON ST. PATRICK'S DAY 2009. 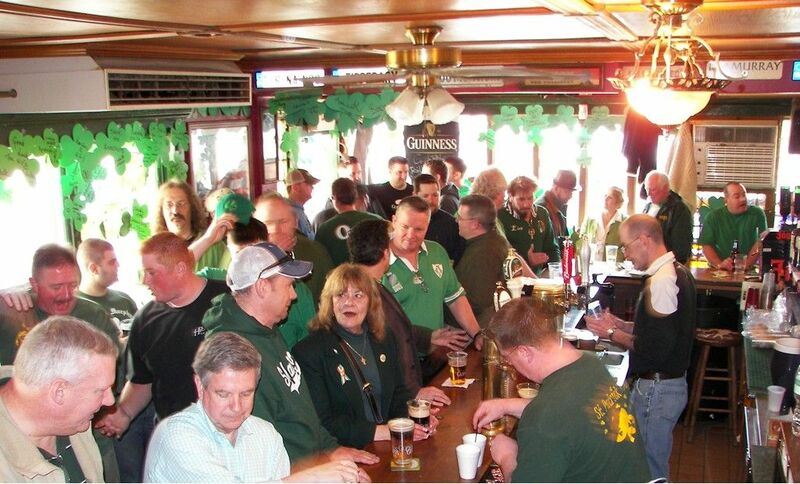 There is certainly no shortage of spirited conversation at the Tir na nOg. The congenial mix of colorful neighborhood fixtures, professionals, artists, musicians, writers, blue collar workers, poets and politicians makes for some lively exchanges. And if you are one that prefers a more melodic form of human expression, there is on most evenings some great live music on the stage. PART TIME BARTENDER JOE RHODES PULLS A PERFECT PINT OF STOUT AS PRESCRIBED BY THE GUINNESS STOREHOUSE HEAD -QUARTERS AT SAINT JAMES GATE IN DUBLIN. HOLD THE GLASS UNDER THE TAP AT AN ANGLE AND POUR DOWN THE SIDE UNTIL IT'S ABOUT 2/3 FULL (TO THE BOTTOM OF THE HARP IN AN OFFICIAL GUINNESS GLASS). SET ASIDE UNTIL THE CASCADING SUBSIDES. BE PATIENT, IT WILL TAKE A FEW MINUTES. THEN, TOP OFF WITH ANOTHER POUR STRAIGHT DOWN THE MIDDLE. THIS WILL CREATE THE PROPER WHITE, CREAMY HEAD ON TOP OF THE DARK, COFFEE COLORED ELIXIR. IF YOU ARE AN ESPECIALLY TALENTED BEER ENGINEER AS IS JOE, YOU MIGHT SCULPT A LUCKY SHAMROCK, OR PERHAPS AN HARP IN THE FOAM WITH ONE FINAL, FLUID MOTION. 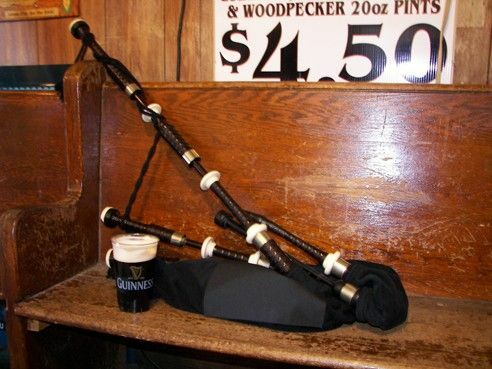 A couple of weeks ago I returned to the scene of my St. Patrick’s Day revelry. I needed to confirm that my fondness and exuberance about the place was not just the result of an excessive amount of March 17th merriment. In the quiet of an early afternoon the tavern had not lost any of its original appeal, in fact the experience was even more satisfying. 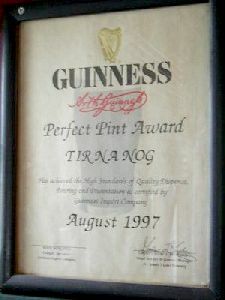 The bar manager, Frank Connell constructed several perfect 20 ounce pints. We talked politics and Irish history in between watching old cowboy movies with the locals. A bit later I enjoyed some delivered deli while discussing traditional music with Tom Glover, a regular performer at the bar. By late afternoon I finally gave into the fact that this pleasant session must come to an end. As I drew my last sip of stout, I caught sight of the image of “Irish" Billy Briggs watching over all who embrace his sheltering legacy. 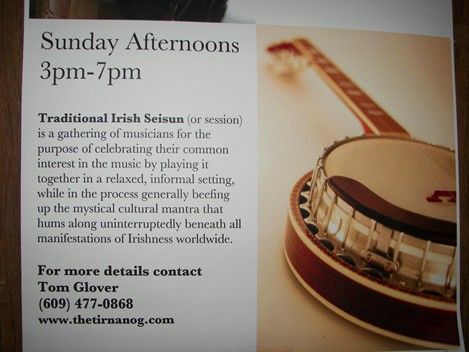 The Tir na nOg . 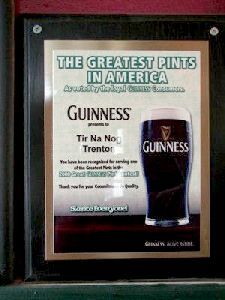 . . a place where justice and Guinness are well served.